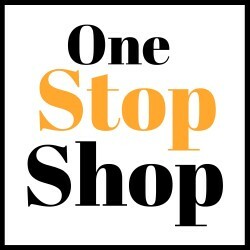 Need a delicious meal for fall/winter?? I sure have it for you today, Slow Cooker Beef Stroganoff!!! Running like a crazed person like myself, your slow cooker should be your best friend. I love pulling it out and coming up with a recipe. My family loves it even more, as when they come home the house is swirling with the wonderful aromas of a delicious dinner cooking away. I have to say I am thrilled to be part of the AllFreeSlowCookerRecipes’s top 100 recipes, come and see all that everyone has to offer in that great post!! This meal was a show stopper and I got rave reviews from both hubby and daughter. They will be thrilled when I make it again for them. 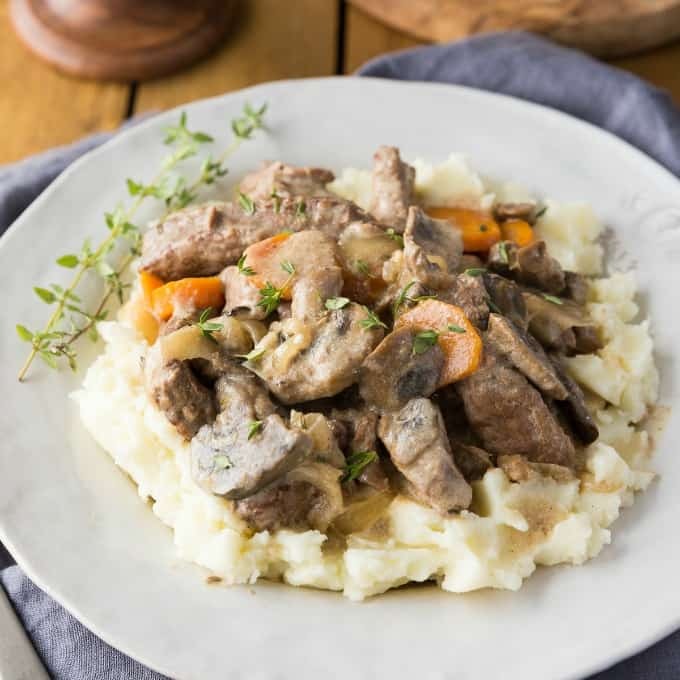 Delicious tender slices of beef mingled together with onion, mushroom and carrots all floating in a rich and delicious wine infused sour cream gravy. My potatoes turned out so light and fluffy and went so lovely with the stroganoff instead of noodles. This is pure comfort food and something you will love to make again and again! 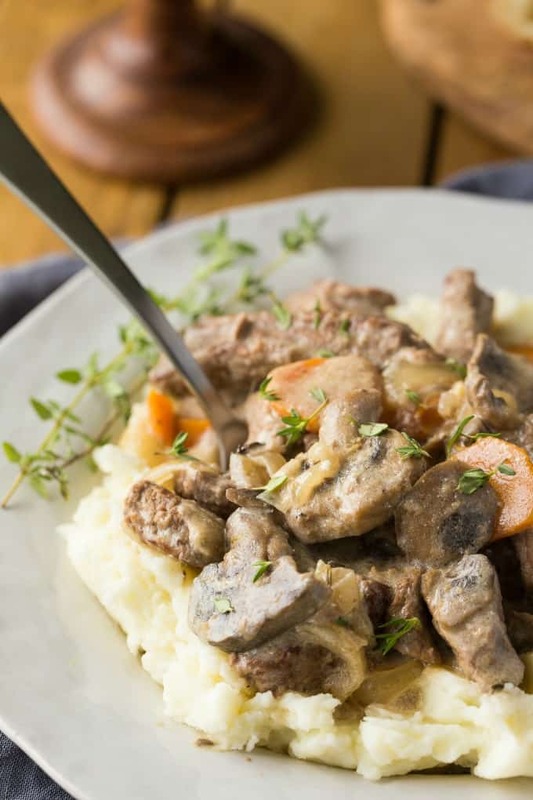 Slow cooker meals are so satisfying and so easy to pull together. 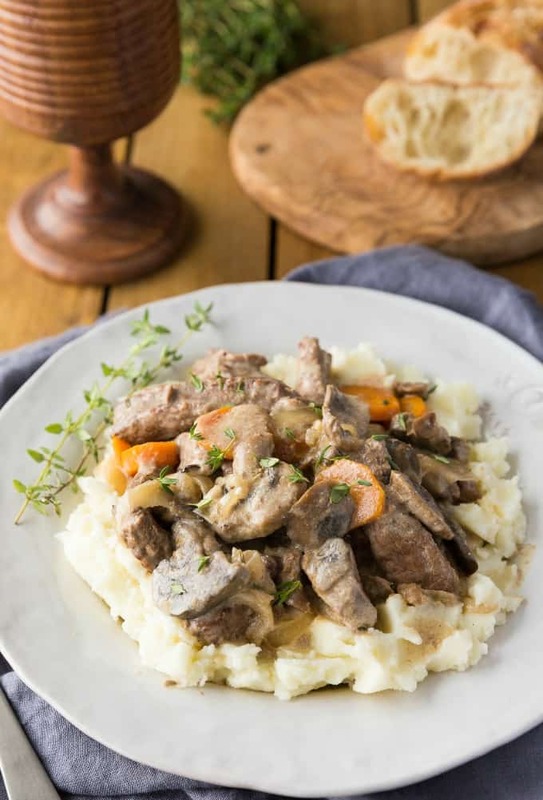 Stroganoff started off in Russia in the mid 19th century and is still loved to this day! A magnificent and easy beef stroganoff!! Whisk flour, salt, pepper and dry mustard together. Toss in steak and cover well with the flour. Spray the slow cooker with cooking spray and add steak and the flour. Add the carrots, onions and mushrooms. Add the beef broth and wine and stir to combine. Cover and cook on low for 8 hours. You may want to stir this once or twice as it may stick a little. Before serving add the sour cream and heat through. Serve over fluffy mashed potatoes. 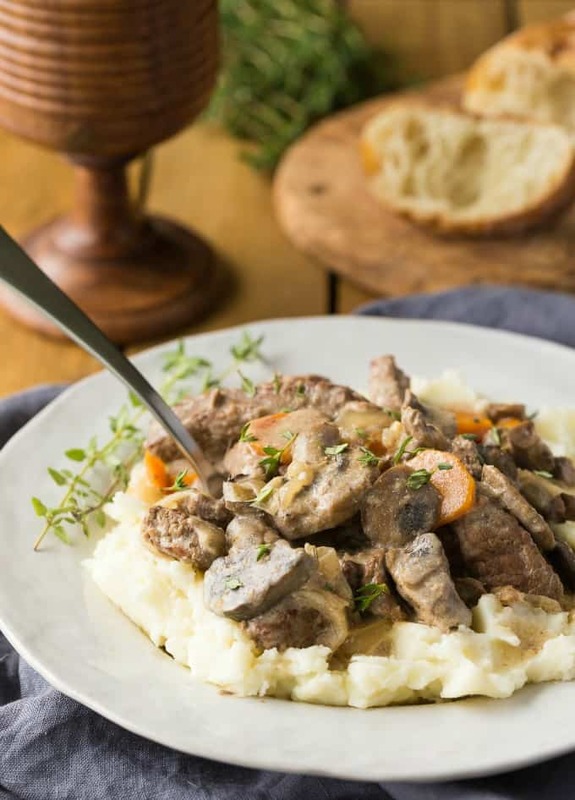 Pull out that slow cooker and thrill your family with this scrumptious meal. ENJOY!!! This looks terrific. I cannot wait to make it for my family. I love that you paired the stroganoff with potatoes instead of noodles. Yum and pinned. Thanks so much Jennie, it was really good with the mashed potatoes!! I love that this doesn’t use some disgusting cream of whatever soup. Also the mashed potatoes! I have copied this to my yummly account and will be making it. Thanks for the recipe! I love my slow cooker too. This looks so delicious, great for a week night dinner. 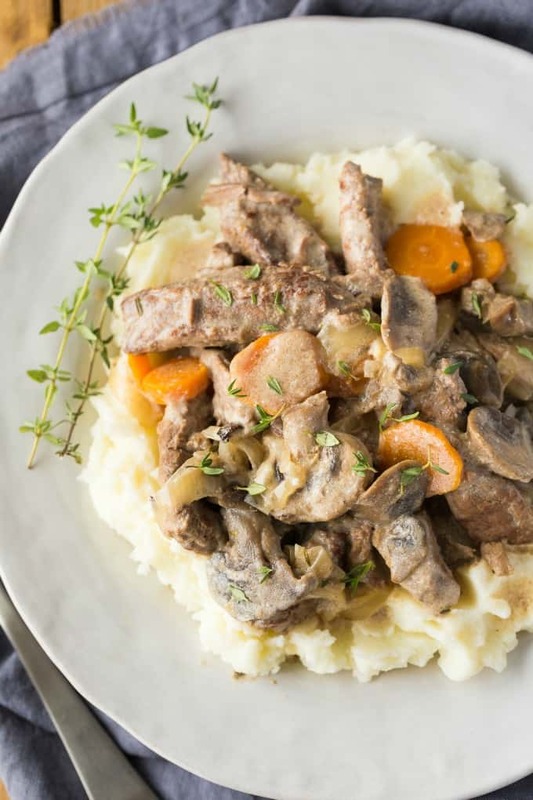 I love beef stroganoff but have only made it the traditional way. I love the idea of toss it in the pot and out comes dinner. I have posted my version of this to my blog with credit to you. Thanks for a keeper recipe. I don’t use wine so can I double up with beef broth? Yup Becky, that would be perfect! I can’t use alcohol of any kind. Can I double up on the broth?